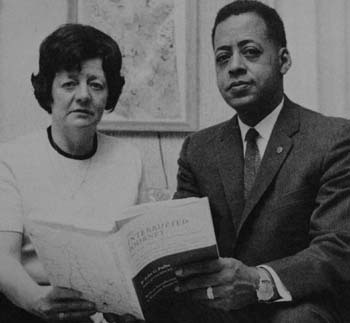 It may be 50 years since Betty and Barney Hill were supposedly abducted by aliens in the White Mountains, New Hampshire, but it is only now that their story is finally due to hit the big screen. Film-maker Bryce Zabel hopes to make the definitive movie about the couple's apparent experience, which was the first widely reported UFO abduction in America. It was back on September 19, 1961, when the couple were driving south on Route 3 through the White Mountains, on the way home to Portsmouth, N.H. when they say they saw a large, lighted object in the sky following them and then rapidly descending toward their car. The Hills said they were terrified as the silent spacecraft loomed closer to them and that was made worse when Barney noticed, through binoculars, what he described as several humanoid figures standing at the windows of the mysterious craft. Fearing they were about to be captured, the Hills drove quickly away but shortly afterwards, the couple said they found themselves 35 miles farther along on the road and realised they couldn't remember approximately two hours of time from that night. Eventually, a well-known psychiatrist and neurologist, Dr. Benjamin Simon, used a technique called regression hypnosis to help unlock the Hills' apparently forgotten memories. Through a long series of sessions, the Hills recounted a tale of being abducted by alien beings into the UFO and given physical examinations before being returned to their car with their memories erased. Back in 1975, Betty told a reporter: 'The first time I saw the occupants was a group of them standing in the highway, just prior to our capture. The reason the story the Hills told stands out from the rest is that it was the first widely publicized report of alien abduction in history and it was filled with details. The Hills, who are now dead, were highly respected members of their community - Betty was a social worker and Barney had been appointed by the governor to serve on the state advisory civil rights committee. Zabel told the Huffington Post that the couple's credibility was among the many reasons he was making the film. 'Whether one agrees that abductions happen or don't happen in the UFO field, this is an important story because it's the first time the world had its focus brought to bear on the phenomenon at all,' he said. Kathy Marden, the Hills' niece, who is also a social scientist, said: 'It was a case that was very thoroughly investigated by top-notch investigators. And what's very important was that Betty and Barney both had conscious recall of the experience, except for the UFO abduction itself. 'There have been many misleading statements in the mainstream media about what Betty and Barney actually remembered. It is often overlooked that at approximately the same time as the Hills said they had their UFO sighting in the White Mountains, Pease Air Force Base in Portsmouth confirmed that radar had picked up a UFO in the mountains. However, sceptics point out that the Air Force concluded the UFO was simply a weather balloon. During hypnotherapy, Betty stated that while they were on board the spacecraft, she communicated with a being who she concluded was the 'leader' of the alien abductors, and she asked where they had come from. He reportedly showed her a three-dimensional map that included many stars with lines connecting several of them. In 1964, under hypnosis, Betty drew a 'star map' and when the Hills' story was eventually made public, an Ohio schoolteacher and amateur astronomer, Marjorie Fish, spent several years studying multiple viewpoints of nearby sun-like stars and found a possible match to Betty's star map. Fish's interpretation of the map was created from the viewpoint of a double star system called Zeta Reticuli. However, sceptics have often suggested that Betty Hill's star map shows merely a random grouping of stars, with no other significance. In July, New Hampshire erected a historic highway marker to commemorate the 50th anniversary of the Hills' reported close encounter with aliens, and this weekend, the Indian Head Resort on Route 3 in Lincoln, N.H., will unveil a special plaque honouring the Hills' memory. 'There's a lot more to know about their story, and I'm going to take the close encounter tour over the weekend,' Indian Head resort owner Peter Spanos told the Huffington Post. Zabel called the Hills' story a classic in the field of UFO reports and said: 'Sceptics will always debunk everything. There are a lot of people who are very vested in being sceptics, and, frankly, we live in a world where we do need some sceptics.